A memoir about writing and editing life, as well as a look behind the scenes at some of the most influential magazines in America (and the writers who made them what they are). 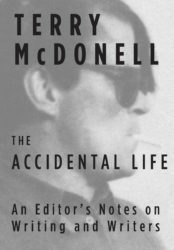 The Accidental Life is one of the most engaging books on editing and contemporary writing I’ve read this year ... McDonell has befriended many of the writers he edited. The result is the sort of exact detail and emotional resonance that creates depth and credibility ... The book shines when McDonell describes writers in conflict with dominant American values ... the book’s grace is a function of McDonell’s clear and unpretentious style. [McDonnell] has worked at 13 magazines, most of them as top editor, and he shrewdly organizes his book as a collection of vignettes, each one with its word count noted at the top since when he edited stories he liked to know how long his pencil had to travel ... He has all the stories you’d expect and tells them with a subtle tension, never succumbing to the easy laugh ... The writing in The Accidental Life is direct and crisp, with a touch of tartness; there is not a bloated or sappy passage in the book. Mr. McDonell can be sentimental, especially about friends now dead (and there are enough to fill a cemetery), but he is never mawkish. The Accidental Life is by and large a fond book. It’s a fan’s notes from a man who, before the apocalypse, edited and often befriended many of his literary heroes ... Don’t come to The Accidental Life looking for score-settling or acid gossip. Mr. McDonell is writing about his friends. He isn’t opening his vault or baring his soul ... Mr. McDonell is proud of each of his teams at the magazines he’s edited, but this memoir is far from self-congratulatory. He writes winningly about his regrets ... intelligent, entertaining and chivalrous. It’s a savvy fax from a dean of the old school. What did you think of The Accidental Life: An Editor's Notes on Writing and Writers?